In my family, it isn’t Christmas without cheesecake. That’s what my cousins say when I bring the glass 13×9 out of the refrigerator and place it on my grandparents’ dining room table once the table is cleared of casseroles and dinner rolls. They’re right, at least in my opinion. The recipe I follow came from my grandma. The story goes that she got it from a family friend decades ago, but my family adopted it as its own ever since. I’ve been making it every year for at least five years now. Sometimes I’ll surprise my family with it on Easter, since it’s such a looked-forward-to dessert. 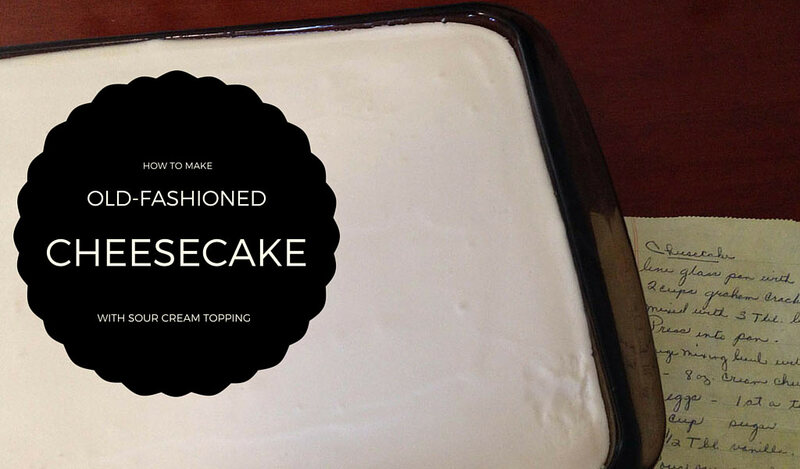 This cheesecake recipe is what I would call old-fashioned. There isn’t a cherry topping or white chocolate raspberry swirls in it. It’s just regular ol’ cheesecake with a sour cream topping. It’s easy to make and pretty inexpensive, too. Make it a classic in your family for Christmas, or any time of the year. I’d say this recipe is simple enough for beginners. You really can’t mess it up. Just follow the directions, remember to set a timer and make sure the cheesecake and the topping are both smooth before putting in the pan. It’s as easy as that! Preheat your oven to 300 degrees F. Take cream cheese out of the refrigerator to soften. Melt 3 tablespoons of butter in the microwave. This will take about 30 seconds, give or take. Crush graham crackers (one sleeve, or 8-9 crackers) and put in 13×9 pan. 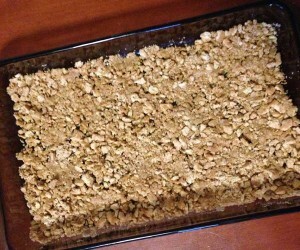 Once butter is melted, drizzle it into pan and mix it in with the graham cracker crumbs. Spread crumbs evenly on the bottom of the pan. In a large mixing bowl, beat the 3 packages of cream cheese with electric hand mixer until it’s fluffy. Add each of the five eggs, one at a time, using the hand mixer as you go. Then add 1 cup of sugar and 1 ½ tablespoons of vanilla extract. Once mixture is smooth, pour over graham cracker crumbs. Bake for 50 minutes. When it’s about time to remove the cheesecake from the oven, make the topping. In a large mixing bowl, mix 1 ½ pints of sour cream, 6 tablespoons sugar and 1 ½ teaspoons vanilla extract with a whisk. Let stand for 15 minutes. Remove cheesecake from oven and let stand for 15 minutes. 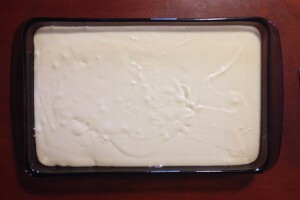 Pour sour cream topping over cheesecake and spread evenly with a rubber spatula. Return cheesecake to the oven for another 10 minutes. Let cool completely, then refrigerate. Mix graham cracker crumbs with 3 tablespoons of melted butter. Press into a glass 13x9x2 pan. In a large mixing bowl, beat cream cheese with hand mixer until fluffy. Add one egg at a time, then add sugar and vanilla. Pour over graham cracker crumb crust. When cake is about to come out of oven, make the topping. With an egg beater (or whisk), mix the sour cream, sugar and vanilla. Once cake has cooled for 15 minutes, spread topping on cake and return to oven for 10 minutes. Let cake cool completely, then refrigerate. You can choose how to slice this dessert. It’s rich, so small pieces are best. You can get 4-5 pieces by 7-8 pieces, yielding between 28-40 slices. 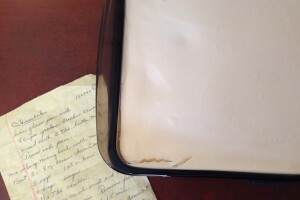 Did you make this recipe, or do you have an alternate way to make old-fashioned cheesecake? Let us know in the comments below. 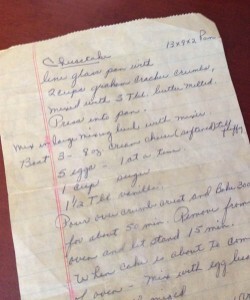 Omg this is the recipe that was taught to us in “Home Economics” in 1972! Have been making it every since and it is best cheesecake recipe. 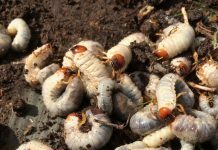 I first used a very similar recipe in 1969 out of either Woman’s Day or Family Circle Magazine and have made it regularly to rave reviews. I recently moved and could not locate my recipe. I used this modified using a springform pan and added a bit of lemon juice to the main batter. The important thing is to not over beat it because, per Alton Brown, you don’t want to add air to it like most cakes. That and baking it in a water bath stopped the cracks I used to get on the top. My husband and son-in-law will enjoy this Father’s Day treat. My recipe is very similar and good, too, and everyone loves them, but it is too soft for my liking. I remember a drier cheesecake from many years ago. (I am 79.) My mother wasn’t a baker and these cakes were from a bakery. I will try yours for sure.